We have just deployed a new rack in our primary data centre running a cluster of ten VMware servers. Each server connects to a pair of Cisco 4948E TOR switches with 4 x 1Gb from each server to each of the 4948 switches. The 4948 switches connect to pair of 6509E switches. The uplinks from the TOR switch to the core switches are currently 4 x 1Gb links but can be updated to 10Gb links in the future if required. The problem with this design is that should a 6509 switch fail the VMware servers would continue to send frames to the now orphaned 4948. What we needed was a way to let the VMware servers know about the lack of upstream connectivity. One way to do this is to enable the beaconing feature on the VMware servers. Essentially each server will regularly send beacon-probe broadcasts out of each interface in the NIC team for every VLAN. If the beacon-probes fail to arrive back at the server the interface would be considered unavailable and a failover would take place to another NIC in the team. 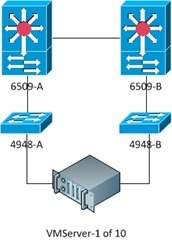 When Cisco switches are used, a better alternative is to use link state tracking. Simply put, link state tracking monitors the interface(s) to the upstream switch (in our case the 6509) and if all the links become inactive, all the downstream interfaces (in our case the links to the VMware servers) would be shut (with error-disabled). As soon as an uplink interface becomes available the downstream interfaces would be re-activated. The first step is to globally enable link state tracking for a particular group number. The number of groups supported on a particular switch is model dependant. In this example, group 1 is used. The second step is to define the upstream interfaces. In our case the upstream interface is a single port channel. The final step is to define the downstream interfaces. If the servers are already in production, be sure to configure the upstream interfaces before the downstream interfaces to avoid an outage. % Ambiguous command:  "link state "
However after entering the command in full, the command was accepted and a test confirmed that the link state tracking was working as expected. Do we have any alternate to Link State Tracking? If all ports are Layer 3 having IP Address, Can we use any other method for upstream and downstream tracking? This post is quite old and I have now retired from full time employment. For L2, as the post mentions, you could use VMware beaconing, or whatever new feature has been added since 2012. For L3, it’s the usual answer, It depends. If the VMware servers are running a routing protocol then a link failure will eventually cause a routing table change and packets will be routed around the failure. BFD could be used to speed up the detection of such a failure.